Freckles are small brown spots on the skin that appear in clusters on the face and arms, which is a common skin condition and in most cases it does not represent a health threat. 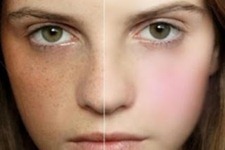 Among people with fair skin, exposure to the sun is one of the main causes of freckling. Additional factors are genetic inheritance, internal infections and other health problems. This article intends to display some possible approaches for freckles. This long-time remedy is proven to lighten melanin pigmentation. When applied directly to the skin, lemon juice also has excellent exfoliating properties. Leave lemon juice on the skin for about fifteen minutes and then rinse with cold water. You can also grind lentils that have been soaked in water into a paste, mix with lemon juice and leave on the skin for about ten minutes. After rinsing, your skin will glow and your complexion will be clearer. A cucumber mask is one of the more popular freckle removal concoctions. Simply grate some cucumber, apply it to your face and leave it on for 20 minutes. Besides cucumber, bleaching masks can be made from other fruits and vegetables such as strawberries, red currants and apricots. You can make your own parsley juice for freckle removal by adding chopped parsley to boiling water, straining the juice and letting it cool. Before applying to the skin, mix with lemon juice or orange juice for additional bleaching. The natural bleaching components in honey can be used to reduce the excess pigmentation that causes freckles. Adding lemon juice and salt will increase the effectiveness of this home remedy. Leave the solution on your skin for about 15 minutes and then rinse with lukewarm water. This unexpected ingredient has a gentle peeling effect on freckled skin due to the presence of lactic acid. Apply either sour milk or sour cream to the skin, leave on for 15 minutes and then gently remove with a soft cloth or tissue. Follow up with a moisturizer to avoid dry skin. This is the easiest medical treatment to undergo and one of the few that can be performed at home. A bleaching cream containing hydroquinone and kojic acid is applied to the skin to fade the appearance of freckles. Besides laser therapy, this is one of the best freckle removal treatments. Also known as chemical peel, this treatment lightens freckles and improves the overall appearance of the skin. Like laser therapy, chemexfoliation should be administered by a trained physician. Talk to your doctor about possible side effects before undergoing chemexfoliation. This treatment method uses liquid nitrogen to freeze off skin growths. It is occasionally used for the removal of some types of freckles, but is more difficult for a doctor to control than laser treatment. According to dermatologists, laser therapy is the most effective treatment for freckles. A green laser light is passed over a freckled area of skin, removing the abnormal melanin pigment that has accumulated and leaving the skin looking clearer. Minor side effects such as crusting and bruising may be experienced, but they usually clear up in a few weeks. One of the newer forms of treatment, IPL therapy utilizes pulses of broadband light to deliver energy to the deeper layers of skin and remove the pigment irregularities that cause freckles. If you chose this method for freckle removal, your skin will not be damaged and there is no downtime.